There is an increasing need to rein in the cost of scientific study without sacrificing accuracy in statistical inference. Optimal design is the judicious allocation of resources to achieve the objectives of studies using minimal cost via careful statistical planning. Researchers and practitioners in various fields of applied science are now beginning to recognize the advantages and potential of optimal experimental design. Applied Optimal Designs is the first book to catalogue the application of optimal design to real problems, documenting its widespread use across disciplines as diverse as drug development, education and ground water modelling. Applied Optimal Designs bridges the gap between theory and practice, drawing together a selection of incisive articles from reputed collaborators. 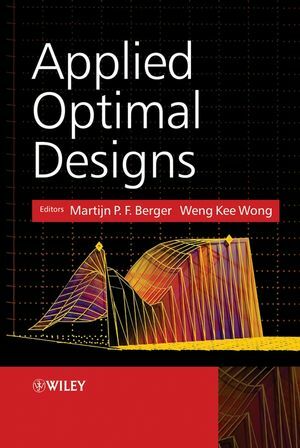 Broad in scope and inter-disciplinary in appeal, this book highlights the variety of opportunities available through the use of optimal design. The wide range of applications presented here should appeal to statisticians working with optimal designs, and to practitioners new to the theory and concepts involved. Martijn P.F. Berger, Department of Methodology and Statistics, University of Maastricht, the Netherlands, and Weng Kee Wong, Department of Biostatistics, School of Public Health, UCLA, USA. 1 Optimal Design in Educational Testing (Steven Buyske). 2 Optimal On-line Calibration of Testlets (Douglas H. Jones and Mikhail S. Nediak). 2.3 Solution for Optimal Designs. 3 On the Empirical Relevance of Optimal Designs for the Measurement of Preferences (Heiko Großmann, Heinz Holling, Michaela Brocke, Ulrike Graßhoff and Rainer Schwabe). 3.3 Paired Comparison Models in Conjoint Analysis. 4 Designing Optimal Two-stage Epidemiological Studies (Marie Reilly and Agus Salim). 4.4 Optimal Design and Meanscore. 4.5 Deriving Optimal Designs in Practice. 4.7 Appendix 1 Brief Description of Software Used. 4.8 Appendix 2 The Optimal Sampling Package. 4.9 Appendix 3 Using the Optimal Package in R.
4.10 Appendix 4 Using the Optimal Package in S-Plus. 4.11 Appendix 5 Using the Optimal Package in STATA. 5 Response-Driven Designs in Drug Development (Valerii V. Fedorov and Sergei L. Leonov). 5.2 Motivating Example: Quantal Models for Dose Response. 5.4 Variance Depending on Unknown Parameters and Multi-response Models. 6 Design of Experiments for Microbiological Models (Holger Dette, Viatcheslav B. Melas and Nikolay Strigul). 6.2 Experimental Design for Nonlinear Models. 6.3 Applications of Optimal Experimental Design in Microbiology. 6.4 Bayesian Methods for Regression Models. 7 Selected Issues in the Design of Studies of Interrater Agreement (Allan Donner and Mekibib Altaye). 7.2 The Choice between a Continuous or Dichotomous Variable. 7.3 The Choice between a Polychotomous or Dichotomous Outcome Variable. 7.4 Incorporation of Cost Considerations. 8 Restricted Optimal Design in the Measurement of Cerebral Blood Flow Using the Kety–Schmidt Technique (J.N.S. Matthews and P.W. James). 8.3 The Statistical Model and Optimality Criteria. 8.5 Bayesian Designs and Prior Distributions. 9 Optimal Experimental Design for Parameter Estimation and Contaminant Plume Characterization in Groundwater Modelling (James McPhee and William W-G. Yeh). 9.2 Groundwater Flow and Mass Transport in Porous Media: Modelling Issues. 10 The Optimal Design of Blocked Experiments in Industry (Peter Goos, Lieven Tack and Martina Vandebroek). 10.2 The Pastry Dough Mixing Experiment. 10.4 Fixed Block Effects Model. 10.5 Random Block Effects Model. 10.6 The Pastry Dough Mixing Experiment Revisited. 10.7 Time Trends and Cost Considerations. 10.8 Optimal Run Orders for Blocked Experiments. 10.9 A Time Trend in the Pastry Dough Mixing Experiment.